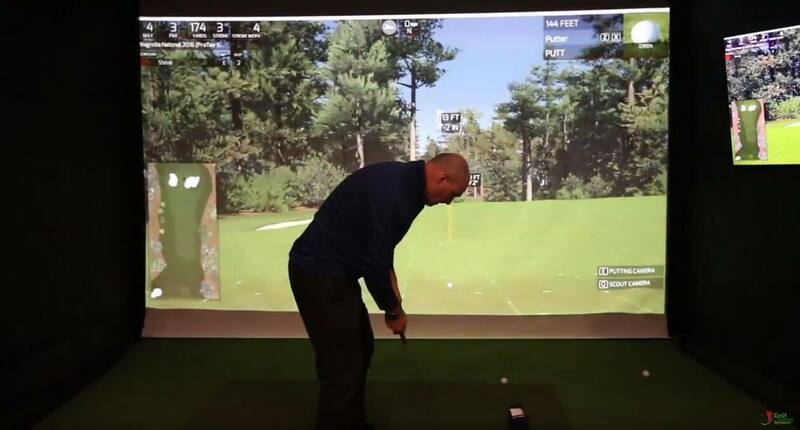 Home / Blog / How does Putting Work on a Golf Simulator? How does Putting Work on a Golf Simulator? We get asked this question every day at Golf Swing Systems so I thought I’d write a blog on this subject. Putting with all the simulators is off the teemat you are hitting from. This is because mot sensors are looking at that position for ball strike and its easier to put the ball in that position rather than move the sensor. One of the best mats we have found to do this is the Tee Turf mat as the surface is very tight and the ball on the SkyTrak system is being measured for the first 14″ of ball roll. This can be used with any launch monitor. A lot of people who have used a simulator before have found putting hard work to do and often blame the equipment, however I find that when people putt on a simulator they are not reading the data that is being given at all or misrepresenting the data. For example if there is a 20ft putt and the ball is only 10ft away from the screen you have to imagine a 20ft put, not a 10 ft one. If there is a uphill lie of say 2″ you then have to imagine a 25″ rather than a 20″ one and if there is a left to right break then this has to be taken into account for the target line aim as well. Below is a video showing putting on the Golf Club Game Software using SkyTrak with an explanation of the data.